Osthe, the Tamil remake of Dabangg, just doesn’t match up to the original. Both are equally inane, but Osthe ends up being a generic action flick with no major redeeming factor unlike Dabangg, which had Salman searing the screen with his persona and action. 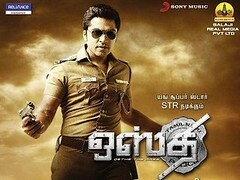 Lead star Simbu is endearing, but no more. The music and action don’t match up and most importantly, Osthe doesn’t have the distinct flavor that Dabangg had, which brought single screen audiences back to cinemas in hordes. Tamil audiences have seen similar but far better films than Osthe, and there is no reason why this film will make a mark. People who hated Dabangg should stay away. People who liked it should stay further away. Like it or not, it is true. Dabangg is one of the most influential films in contemporary Hindi cinema. It has, in its own fist-thumping, water-hose twirling way, defined the kind of films we are subjected to these days. Unfortunately, Dabangg has to endure the ignominy of being clubbed with the very same films that have attempted to cash in on its hysteria. So people will always say Dabangg, Ready and Bodyguard in the same breath, even though Dabangg is so much more than the tripe that has followed it. The film has even managed to buck the recent trend of South Indian films being remade into Hindi, by inspiring its own Tamil remake. Osthe, starring Silambarasan (Simbu) in the lead role, stays faithful to its source frame-by-frame, so much so that it even gets bicep-flexing baddie Sonu Sood to reprise his role. For a multitude of reasons however, Osthe falls way short of Dabangg. Surprisingly, Osthe is nowhere near Dabangg even in the technical department. The action isn’t nearly as well executed, and the VFX look just mediocre in most places. Also, the action sequences are poorly cut. The songs, though, are extremely catchy, especially the title track. However, there was a certain naughty innocence in the soundtrack of Dabangg that Osthe just doesn’t manage to recreate. Needless to say, I don’t even remember the tune of Mallika Sherawat’s item song. And then there is Salman Khan. Make no mistake, Simbu (or ‘Young Superstar STR’, if we are to believe the opening credits of Osthe) is endearing as hell. He has style, dances well, is athletic, and has a charm about him that is hard to ignore. But few in the whole wide world can match up to Salman Khan’s blazing screen presence, especially in a film like Dabangg, where Salman seems to have had the time of his life. Even the sentence ‘Simbu’s shirt gets ripped off in the end’ sounds like someone is trying to make Chhatrapati Shivaji Terminus out of Lego. As I said though, the above are merely superficial differences. (Yes, even Salman Khan.) The reasons why Dabangg works and why Osthe doesn’t lie far deeper. Dabangg isn’t great cinema, of that there is no doubt. However, Abhinav Singh Kashyap never pretended that that was what he was making. The makers of the film reveled in the ridiculousness that played out on screen, rendering popcorn passé and celebrating chana jor garam instead. In the process, Dabangg also captured a wonderful flavor of the Hindi heartland. Try watching Dabangg without looking at any of the central characters or action, and you’ll know what I mean. It may not seem so at first sight, but Dabangg was well and truly ‘different’. Osthe, on the other hand, just follows a long line of similar films that have been coming out of Tamil Nadu since time immemorial. Punch lines, style, action, catchy songs but no real plot – all these elements are not new to Tamil cinema; they can make these films in their sleep. When they wake up, we get Vinnaithandi Varuvaya, Alaipayuthey, Anbe Sivam and the likes. Simply put, Dabangg will, for right or wrong, always be remembered, while Osthe will just fall by the wayside. The only thing that is remotely comparable in these two films is the fact that Osthe’s lead actress Richa Gangopadhyay is as inconsequential to the film as Sonakshi Sinha was. One wonders how director S. Dharani and the producers of the film didn’t realize that what they were making was so hackneyed; that no matter how much they proclaimed their lead actor was a superstar, the only way they could make this film memorable was if there actually was an attempt to push the envelope, to do something different. Ultimately it boils down to the simple fact that Chulbul Pandey will be a character that won’t be forgotten in a hurry. Osthe Velan, on the other hand, is bound to fall by the wayside. This review is by guest reviewer Pradeep Menon. Pradeep is a filmmaker and a dreamer. He loves books, rain, winters, tea and his parents. Cinema, however, is the only truth he believes in. He breathes and bleeds film, mostly in hues of saffron, white, green and blue. You can watch his short films at www.youtube.com/cyberpradeep.